Kidderminster Harriers have appointed Rod Brown as their new chairman. The experienced former local non-league manager only joined Harriers as vice-chairman a month ago. But he has stepped up to take charge in the boardroom at the Conference club in the wake of previous Harriers chairman Ken Rae's resignation on Friday. "He has identified several areas where he believes the club can be improved to its financial benefit," said a Harriers statement. "Rod's background includes the running of several businesses both past and present, mainly within the publishing industry. "He brings 25 years experience of football management and is a great asset. He has spent the last five or six weeks studying all the aspects of the club's management structure and current financial position. "During the upcoming close season, Rod and the new board of directors will be finalising their review of the club's procedures and putting in place a playing budget and a financial structure to take the club forward with a view to attracting new investment." Brown, who has managed at Halesowen Harriers, Bromsgrove Rovers, Rugby, Stratford Town and Stourport Swifts (twice), has worked with current Harriers manager Gary Whild in the past at Redditch. His initial appointment to the board at Aggborough on 17 March was a response to the club's appeal for new investors back in August. The Harriers boardroom changes - fellow directors Gino Ruffinato and John Davies also stood down last week, along with Rae - come at a time when the Harriers need perking up both on and off the field. Having been forced to prune the playing staff budget, they have won just once in 13 games to slip to 14th in the Conference table. 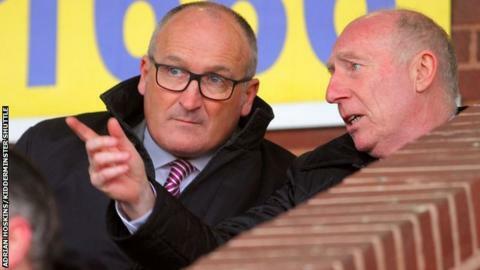 And Whild, appointed a year ago following the sackings of Steve Burr and Andy Thorn in the space of two months, told BBC Hereford & Worcester last month that he has considered quitting as manager.